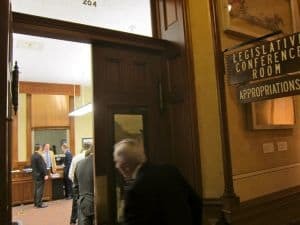 As Wyoming lawmakers prepare for the 2015 session, they will look to a fiscal profile projecting a modest $4.4 million budget shortfall for the rest of the the 2015-2016 biennium. In the context of $3.5 billion in General Fund spending, that projected deficit of .125 percent is not much to worry about. Yet, the profile creates the impression that Wyoming is in a minor revenue drought, which Gov. 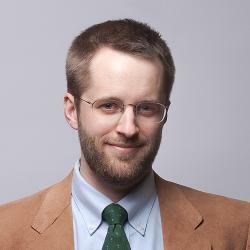 Matt Mead (R) says is inaccurate. “In terms of (state revenue estimates) that reflect a shortfall of $4.4 million, that doesn’t tell the whole story, because we have more than enough money for this supplemental budget,” Mead said in a press conference on Monday. Behind the scenes, the fiscal picture is overwhelmingly positive, especially when it comes to savings. Wyoming’s “rainy day” account has doubled to $2 billion and the Permanent Mineral Trust fund has grown by 55 percent over the past four years, Mead said. The fiscal profile with the $4.4M deficit doesn’t explain that the state stashed an astonishing $793.4 million into various savings accounts over the summer. Most of that money went to three accounts. The state’s Permanent Wyoming Mineral Trust Fund took in $127.1 million in new savings. More than $368 million went to the short-term “rainy day” account. Another $276.3 million went to the Common School Permanent Land Fund, a long-term trust for schools. 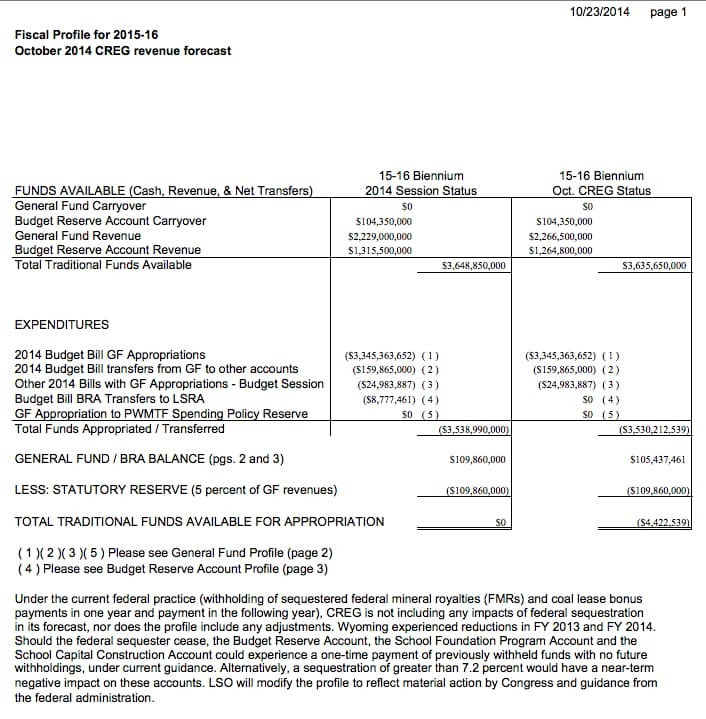 Finally, $21.3 million went into reserve accounts for the General Fund and schools. The wide gap between $793.4 million in savings and the projected $4.4 million shortfall is one starting point for debating Gov. Matt Mead’s proposed supplemental budget request. Some say the state is hoarding money without having an open discussion about savings while many of Wyoming’s counties, towns and residents are in need of help. On the other hand, some lawmakers believe the current savings process reflects a healthy fiscal discipline to set aside money for hard times that might lie ahead. During recent sessions lawmakers have informally proposed savings goals of $3.5 billion in the “rainy day” fund, and $8 billion in the Permanent Wyoming Mineral Trust Fund by 2018. As of this writing the funds have respective balances of $1.996 billion and $6.846 billion. Mead continues to recommend growing the “rainy day” fund to $3.5 billion, enough to cover a full biennium of spending, as soon as possible. Gov. Mead said the time for a discussion about the state’s savings strategy is now, because there are communities that say they have been facing the proverbial rainy day for a long time already. Some are considering creating special districts to increase tax revenue. The amount of money Wyoming spends and saves is publicly reported and available in fiscal documents. Yet the process is sufficiently complex that only a few elected officials, legislative staffers, and members of the public know how it works. Still, even veteran lawmakers like Brown acknowledge the learning curve is “pretty steep.” Having the political wherewithal to understand the state’s revenue flow — and then tweak it — provides the proverbial keys to the kingdom. 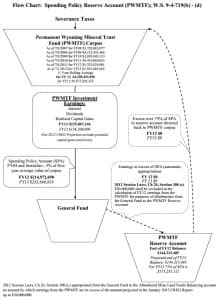 When sketched out on paper, Wyoming’s savings policy looks like a Rube Goldberg machine, with numerous investment accounts generating revenue that tips into other spending policy reserve accounts when they reach a certain cap. A dollar earned by selling a stock in the Permanent Wyoming Mineral Trust Fund might wind its way through two or three other funds before getting sent back to the permanent mineral fund where it started, and where lawmakers can’t touch it. The dollars at play are significant. Mead noted that this process has swept $264 million into the Permanent Mineral Trust Fund over the past four years. This savings apparatus runs relatively independent from the Legislature’s usual budgeting process. That’s because most ongoing appropriations rely on relatively steady revenue streams from sales and use tax and federal mineral royalties. Investment income, on the other hand, is one of the most volatile classes of state revenue, and one that lawmakers say can’t be relied on for appropriations. A recent Legislative Service Office report shows that investment income in a given year can decrease by as much as 47 percent, or increase by 77 percent. Out of all the classes of General Fund revenue, investment income, severance taxes and coal lease bonuses are the most volatile. The Treasurer’s office includes only dividends and interest in drafting revenue projections, reasoning that capital gains income might not be there at all. 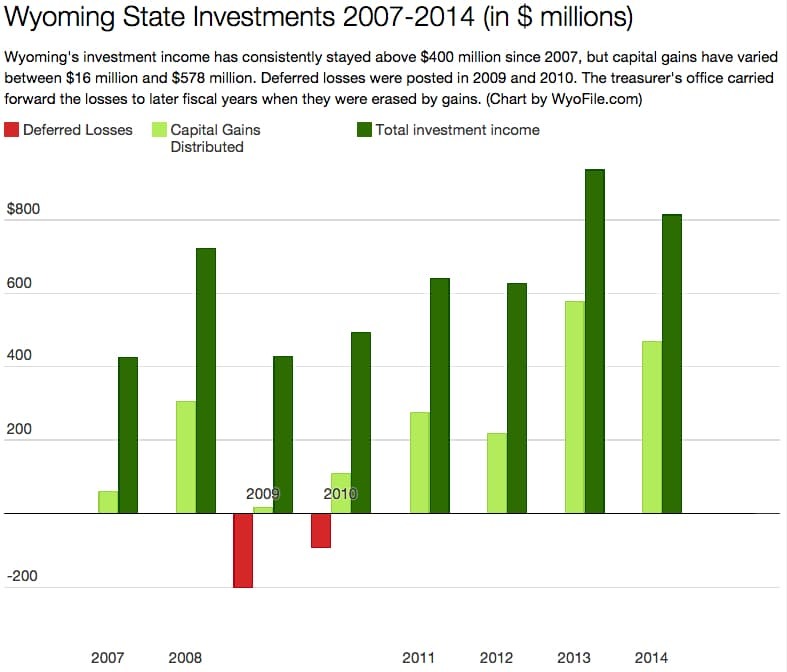 The office never presumes such gains from Wyoming’s $18.8 billion in investments, which routinely generate more than $100 million in revenue at the end of the fiscal year. Mead noted capital gains for the Permanent Mineral Trust Fund of $152 million in 2011, $99 million in 2012, $232 million in 2013, and $266 million in 2014. Capital gains for the Common School Account in the Permanent Land Fund made the overall total even higher. Those capital gains get tallied in July, providing an infusion of cash that sets Wyoming’s savings machine to work — at roughly the same time most lawmakers are absorbed in their day jobs, or perhaps taking fishing vacations in the mountains. When lawmakers get back to Cheyenne in January, they will debate what to do with just tens of millions in the General Fund supplemental budget, while hundreds of millions in new state investments buy government bonds and corporate stocks around the world. “One of the things that is critical for Wyoming is not only to have these savings and securities, but to have our roads and infrastructure in place so that if oil goes down or coal goes down, we still have the facilities to (attract businesses) to invest in Wyoming,” Mead said. 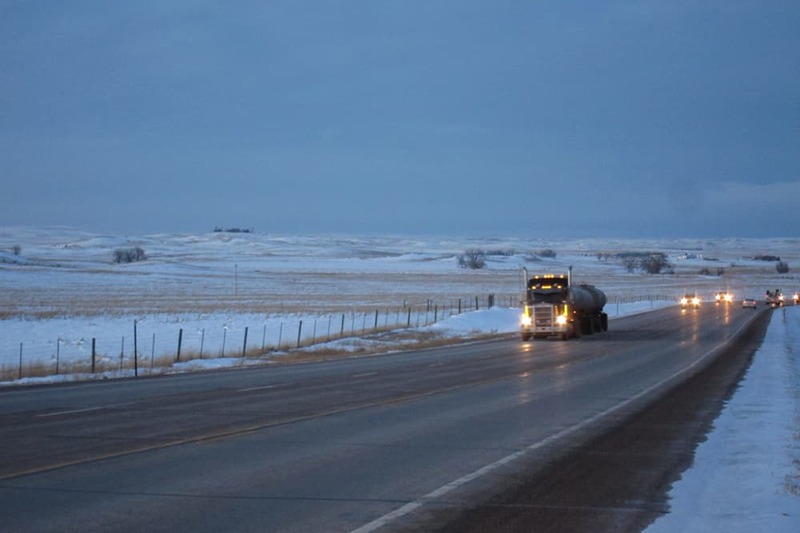 Mead proposed spending for new passing lanes on state Highway 59, a high-traffic two-lane that runs through the heart of the oil boom underway in the Powder River Basin. He also recommended funds for several community college buildings, the Gillette Madison pipeline, a state-planned industrial park, the Wildlife and Natural Resources Trust Fund, State Capitol Building renovations, the University of Wyoming Science Initiative, and water development projects. No matter how Wyoming invests, Neal said he hopes the state can be more transparent in its savings process. “I hope the governor is pushing for an end to this gamesmanship where legislators cry poverty to the public when they are looking at funding programs, and at the same time they know their left hand is (putting) hundreds of millions into savings,” he said. Others believe the state should make a move to simplify its savings process. “You end up with all these coffee cans, and they can say there is no money in the General Fund,” said Jayne Mockler, a former Democratic state Representative from Cheyenne who served for 16 years. “Well of course there is not. — Gov. and legislators clash on savings, agree on spending, February 5, 2013. — CREG reports record 2013 revenue for Wyoming, but flat projections, October 25, 2013. — Minority leader wants open debate on savings, April 1, 2014. — Wyoming’s Permanent Mineral Trust Fund can’t entirely protect the budget from volatile commodity prices, by Samuel Western, February 12, 2012. 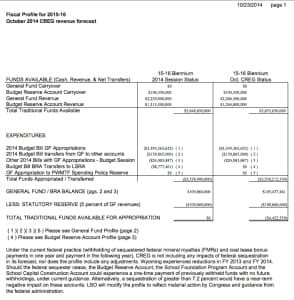 I see the Governor included the PWMTF RA (otherwise known as the PWMTF Spending Policy Reserve Account SPRA) in his calculation of available revenue. That’s a first if I remember correctly, but I wonder how many people, legislators included, know what the original intent of that account was. 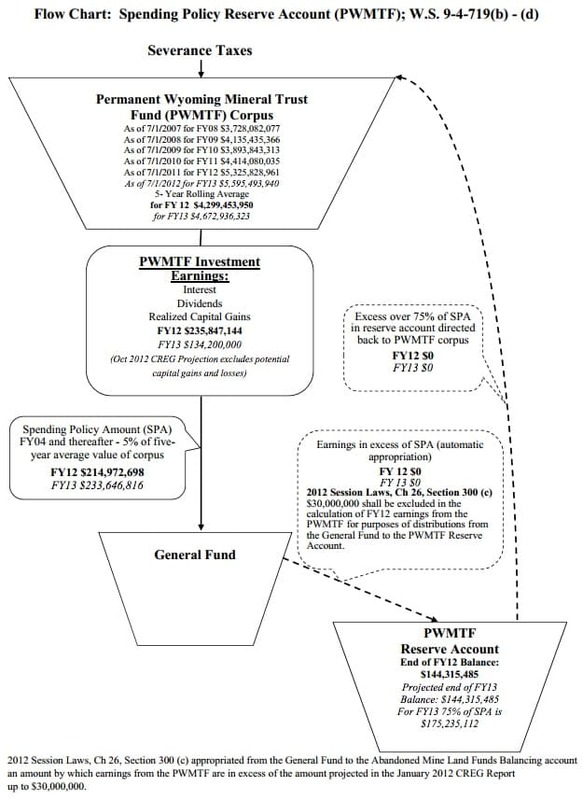 It was established statutorily while Cynthia Lummis was State Treasurer and it diverts PWMTF investment income from the General Fund into the SPRA to be used to transfer money back to the General Fund whenever the actual investment income from the PWMTF fell short of the projected investment income. It only happened once since inception and the legislature promptly changed the statute to stop the auto transfer. Since then, it has been used as a way to divert General Fund money into the SPRA and ultimately transfer it to the PWMTF. Since CREG (at the insistence of the Treasurer’s office) does not include capital gains in the official revenue projections, they will never have actual revenue fall short of projected revenue, thus there is no need for this account what so ever. It could easily be done away with, or CREG could include some capital gains in its projections and if the actual comes in less, then use the SPRA for what it was originally intended, to make up shortfalls in projected investment income. Just more “budget/revenue gamesmanship”.